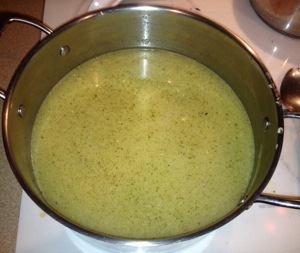 2-32oz boxes of chicken stock or broth or homemade is even better! Ladle your noodles over a bed of mashed potatoes and eat your heart out. 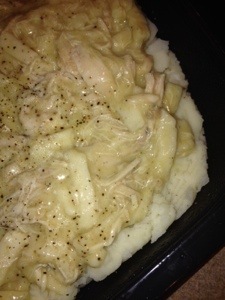 If you don’t have a great mashed potato recipe, here is a great one from my frugal gal Loaded Mashed Potatoes! This recipe is delicious. A very warm meal on a cold day. We didn’t have the noodles and substituted Essenhaus Extra Wide Home-Made noodles (dried) – we dumped the entire package of dried noodles into the broth mixture and simmered for 20 minutes. Add a bit of salt & pepper (to taste) – wonderful flavor and great consistency over potatoes. Yum!! That sounds super good! Thanks for sharing! How many bags of noodles did you use, just one? I used just one, but two would work too! Enjoy! This might be a dumb question but does the chicken need to be cooked first? Yes, cook the chicken or turkey first! I’ve also used a whole cooked chicken as well and it was super good! We don’t have poultry seasoning in New Zealand, at least I don’t think we do, is there anything else you could use? My poultry seasoning bottle says it includes: sage, thyme, rosemary, marjoram, black pepper, and nutmeg. My nose says that sage is the main ingredient. What makes it get thicker? The noodles should thicken it up! Also, don’t forget the two cans of cream of chicken soup! Canned Chicken Breast works awesome too, I buy mine at Walmart it’s 2 cans with a wrapper around it, I forget how much it costs. But I typically use 1 can, I just break it up finer than what is in the can, and I use the juice in my water with my noodles 🙂 If I’m making a lot I use the 2nd cans juice in my mashed potato water 🙂 I also add chicken Bullion cubes to both the chicken and noodles and the mashed potato water. I also use the same noodles from the Frozen food section, but if I don’t have any then I use Egg noodles, I am actually making this tonight and just my luck I had neither style of noodle, so I’m making it with the spiral noodles – hopefully it’s just as good. maybe just one 32 oz of stock…? How long does it cook on the stove? And at what temperature? I’m excited to try this. I replied to a previous comment, so maybe I’ll get a better response from my own comment, but it cooks for how long and at what stove temp? Amy- im from nebraska as well- ainsworth is my home town. Lurz is my maiden name!!! Im really not crafty in the kitchen. Can u tell me how to make ur homemade noodles? could this be made in the crockpot… I hope?? 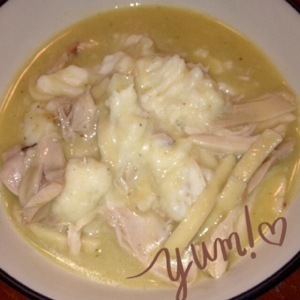 Just wanted to tell you I stumbled across this recipe on pinterest a few months back and have made it numerous times so many in fact I don’t need to look at the recipe anymore! It’s delicious and so comforting on a cold Indiana day. Most of the time I use homemade egg noodles but if I’m short on time I just get some Amish egg noodles and they are just as good. Thank you so much for allowing me to add this to my family cookbook! What size of cream of chicken cans? We have the family size or just the regular size? Dumb question, but do I thaw out the noodles before adding them? This was awesome! I used penne noodles….. They worked great! Family loved it! Thank you for this recipe! 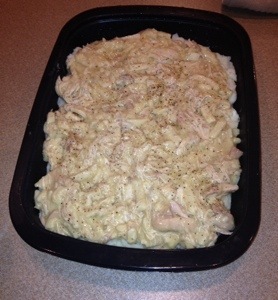 My fiancé wanted chicken and noodles like grandma (two states away) always makes… this it a dead ringer. I don’t understand why all the other recipes call for a stick of butter! It doesn’t need it and it really makes it unhealthy too! This is perfection!